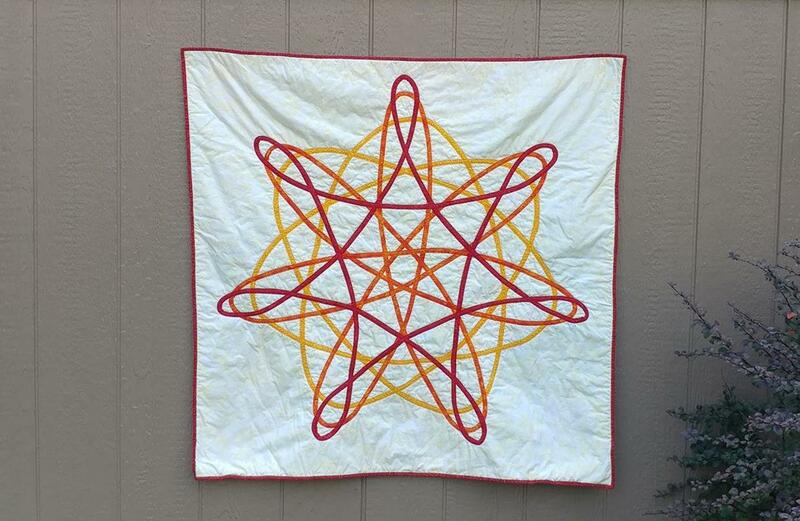 This quilt started with a Spirograph image I found on Pinterest. Next, I acquired my dad's original (and now vintage) Spirograph set. 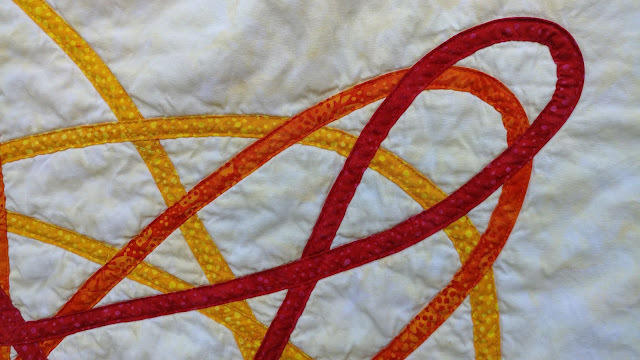 I chose a yellow, orange, and red batik and drew the image I would attempt to replicate as a quilt. I originally planned to use 1/4" bias tape and six colors, but I quickly found the bias strips were quite time consuming to make and not as accurate as I wanted. 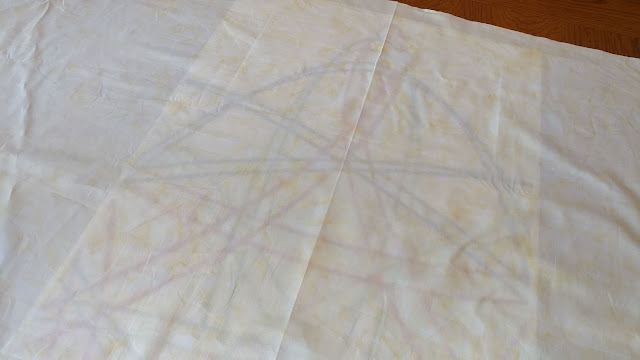 I altered the plan a bit and decided that three colors in 1/2" bias tape would still convey the idea and fit a bit better into my sewing schedule. 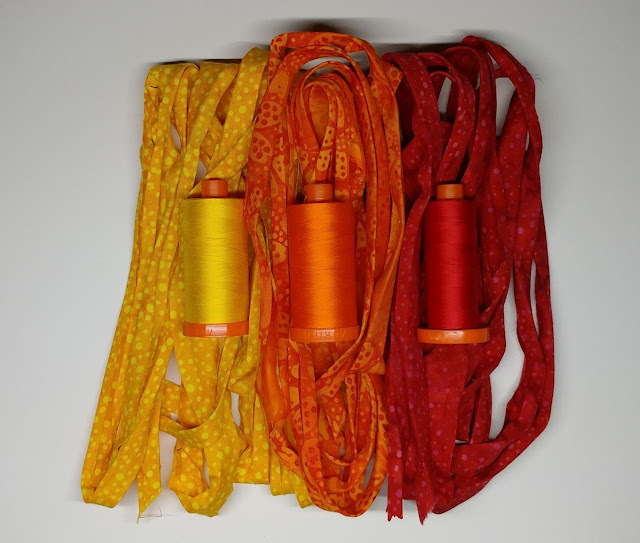 I chose three fabrics from the "Spring Blossoms" line for the bias tape: Mini Dot in Cheddar (yellow), Floral Dots in Pumpkin (orange), and Mini Dot in Pomegranate (red). I chose matching 50wt Aurifil threads: #2135 Yellow, #1104 Neon Orange, and #2250 Red. Next, I enlarged the Spirograph drawing so that one "arm" of the drawing was 20" from center to tip. This used six pieces of paper that I taped together. I used Parchment for the background fabric and cut it into a 42" square. I pressed it well and marked the center. 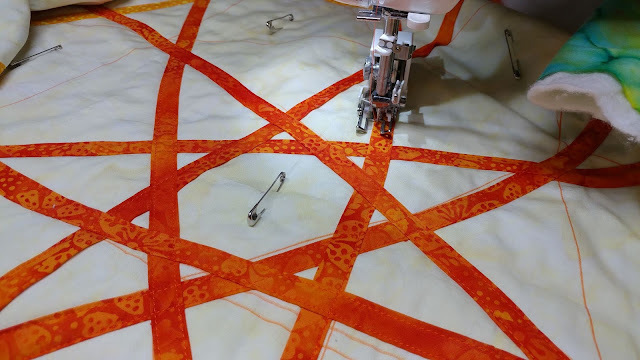 I placed the printed image under the background fabric and traced the design using an air soluble marker - which I quickly realized would disappear much faster than I would be able to work. So then I traced those lines with a Crayola washable marker. I also printed a circle template with sevenths marked (since this design has seven star points). 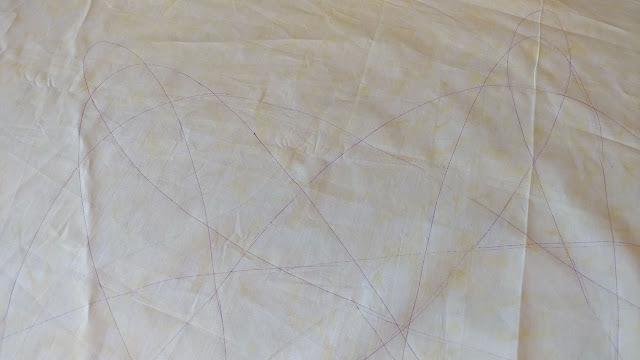 I used the circle to line up the "arm" template each time I rotated the fabric. The design didn't transfer "perfectly," so I had to fix a few lines to make them appear more "perfect." I pin basted the top and backing fabric with Hobbs Heirloom cotton batting. 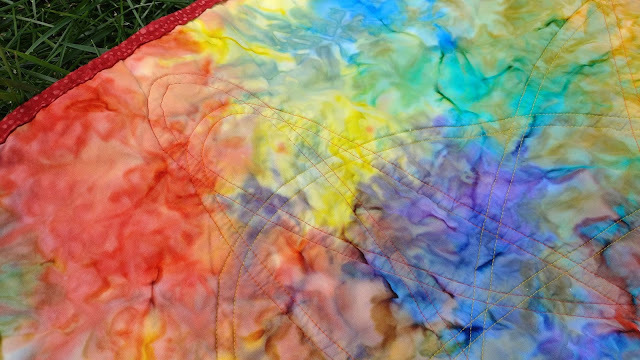 The backing fabric is a tie-dye looking fabric called Tourmaline. After basting, I used my iron to press the bias tape along the lines, pinning it in place as I went. I joined the two ends with a straight seam just like I do my binding. I just made sure to start in a place where that seam would fall on a fairly straight line. I used my walking foot to stitch just inside the edge of both sides of the bias tape. Yep, that's me sewing the bias tape down while nursing. 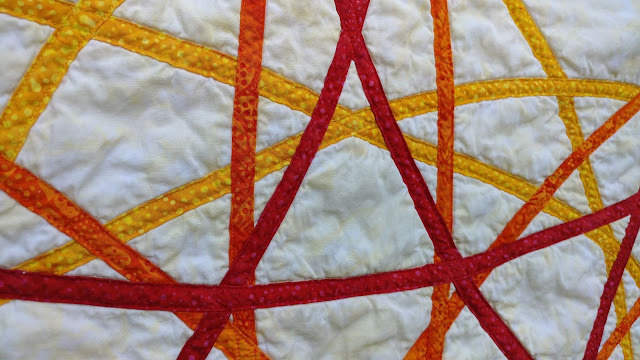 Once the yellow bias tape was stitched down, I repeated the process with orange, then added red last. 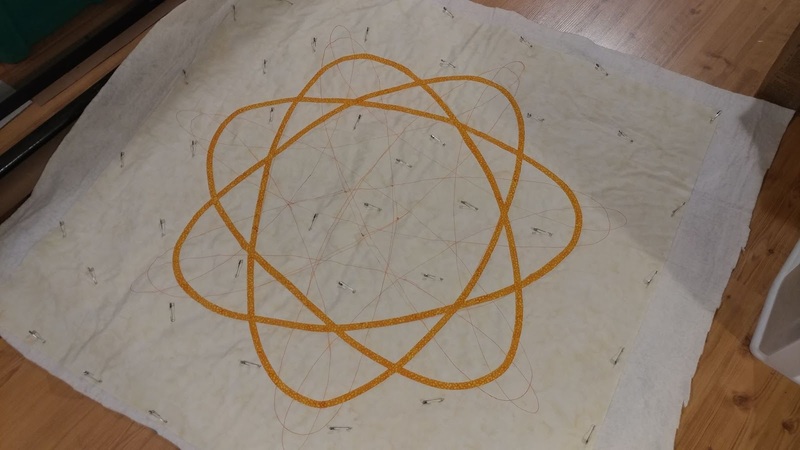 Once all the bias tape was stitched down, I decided I didn't want to add any more quilting to the background fabric. I thought it might distract from the star. However, after washing, I've changed my mind. The batting shifted a bit around the outside edge and is now a bit lumpy. I plan to cut the binding off, quilt the background area, then rebind. Lesson learned. 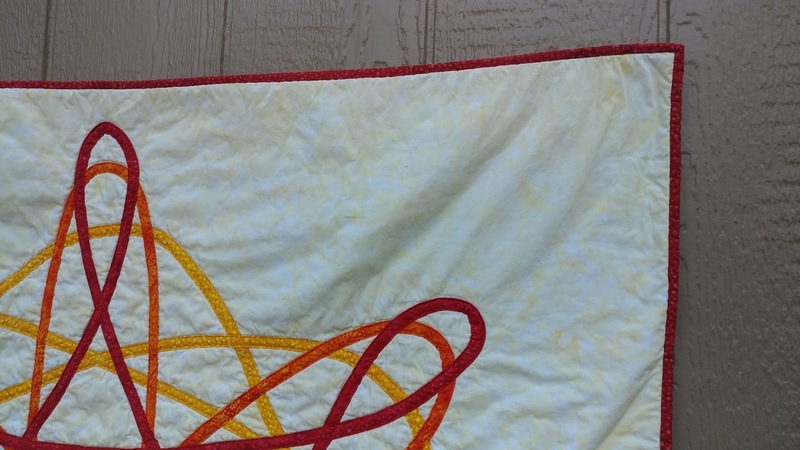 I used more of the red dot fabric for 2 1/4" binding that I machine stitched on. So I guess even though this quilt is technically finished for now, it's still going to sit in my WIP pile. I will count it as quilt finish number 46 for the year, but it's going to be in timeout for a bit. Any suggestions on how to quilt the background? Would you just quilt the outside area or the background that's inside the bias tape too? The back is quite fun too! I love the design the quilting makes on the back! Overall, a really fun quilt! 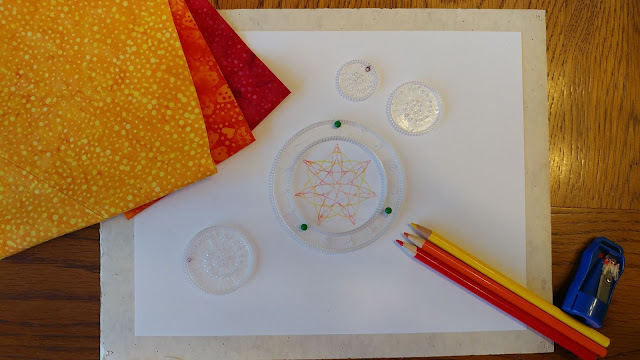 I see so much potential for repeating the idea with different Spirograph designs! A fun challenge that let me try out a crazy idea! I can't wait to see what my irrational brain decides to do next month! All fabrics for this quilt provided by Island Batik. Batting provided by Hobbs Batting. just gorgeous! and the patience for this!! wow!! Absolutely incredible. I loved my spirograph as a kid. It never would have occurred to me to turn it into a quilt. It's stunning. Perhaps an idea for quilting would be to do a starburst around the outside. 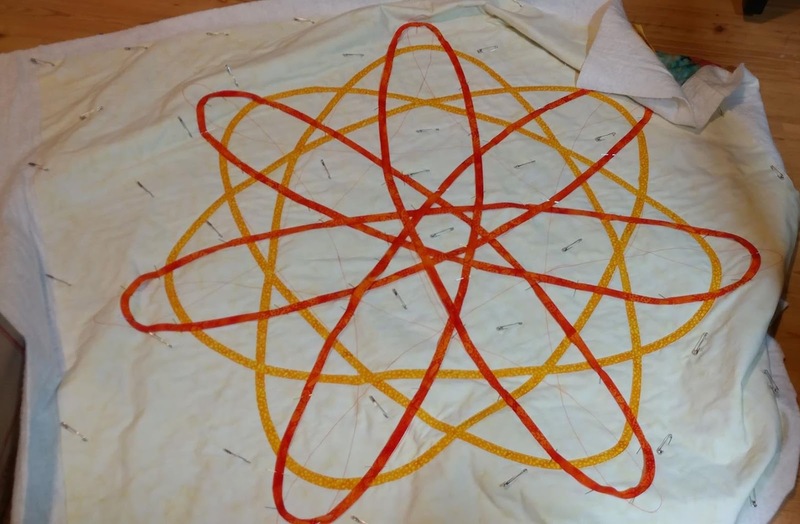 Straight lines going from the coutside of the spirograph to the edge of the quilt. That is so cool! 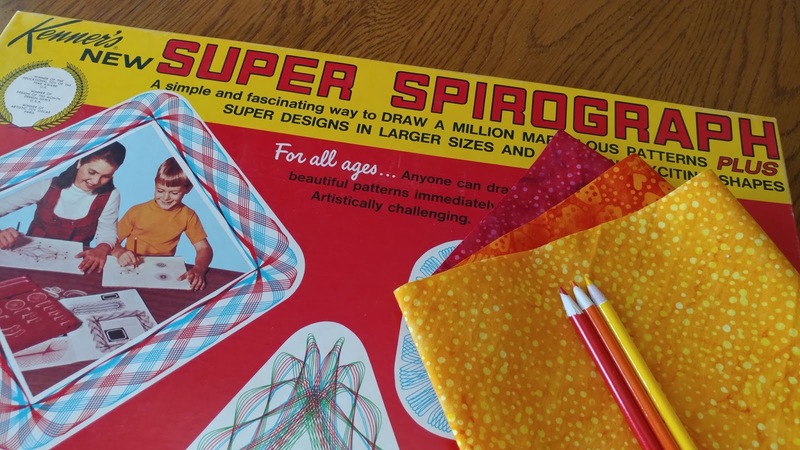 I used to play with my Spirograph for hours. 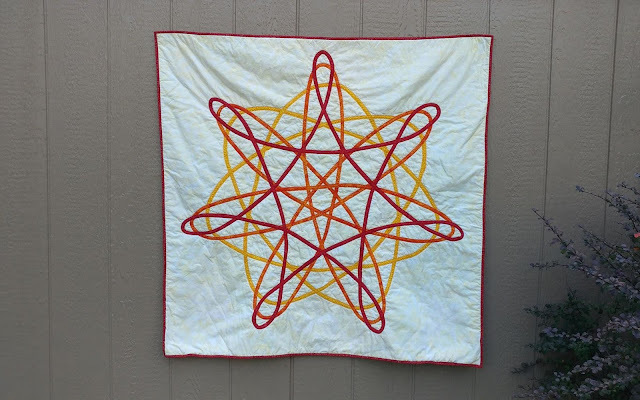 I've been thinking about using a spirograph for quilting designs - hadn't thought about it for applique. You did a wonderful job. When I look at it. 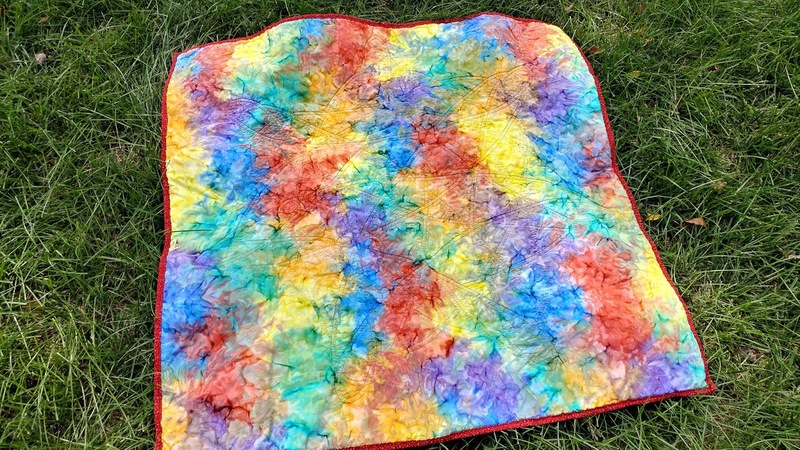 I'd probably echo quilt around the outside until I get to the edges. Would probably echo a little inside too if the spaces are too big. You are a super mom...I always read when I was nursing the baby. I remember my Mom reading the comics to us when she nursed the latest addition to the family. second of seven. 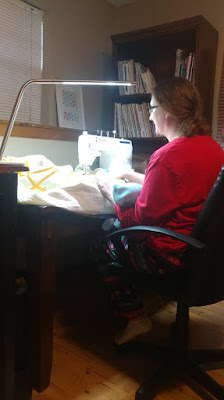 I'm with Bobbi with straight lines going out...maybe 3 lines 1/4" apart then a 1" space on the outside of the quilt, repeat. Make it so that every corner is hit with the center line of the three lines. I love your quilt!! 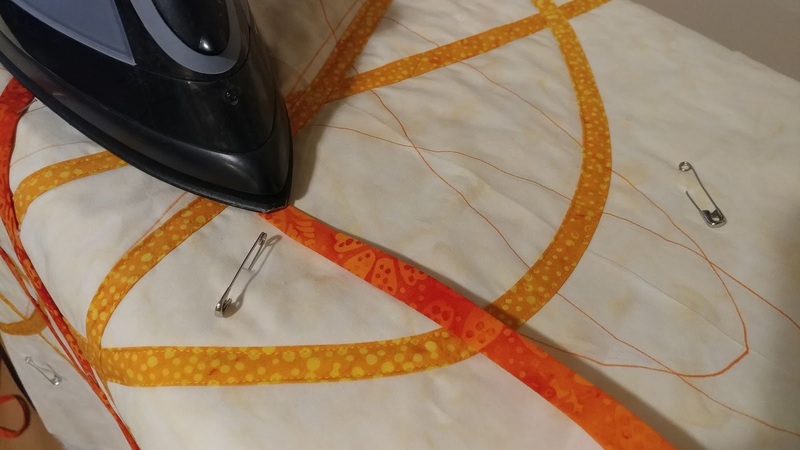 I have found that no matter what the batting says, no more than a 4" gap between quilting - never a problem for me because I am into really dense quilting!! Why didn't you use a double needle to put the bias tape on the quilt...just wondering??!! I used a double needle to put some bias tape on a quilt, but it was not a quilt sandwich and I don't think I used my walking foot. 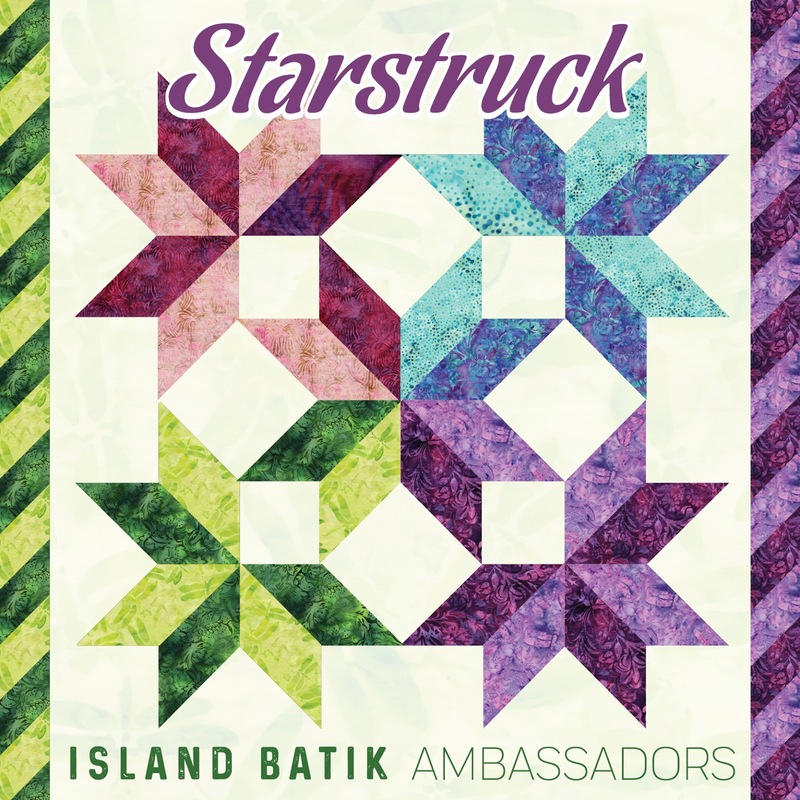 A beautiful quilt, indeed! Your " irrational" brain makes wonders! What a great idea! It turned out spectacular. 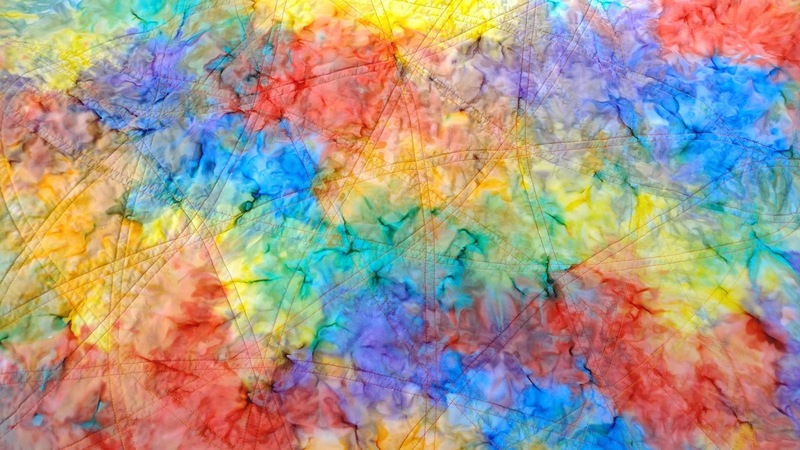 I love the colors you used too! You are sew clever!!! I do enjoy seeing where that brain of yours takes us (in quilting land). Enjoy your baby. Before you know it, he will be grown and then there will be more time than you want to quilt and do all the other stuff you didn't have time for earlier. Your son must be an easy baby! Mine would never have stood for that...he was always moving. You made me miss my spirograph, may have to go out an get one. You really do slay me with your ideas. Terrific! I look forward to seeing the series. Fabulous creativity. 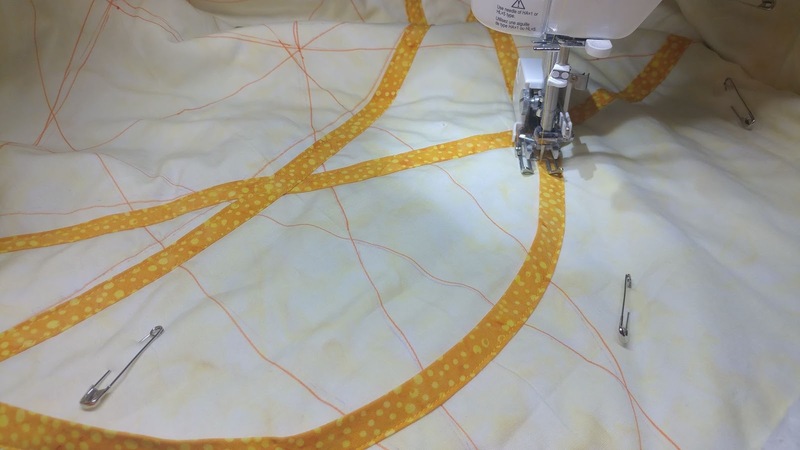 Thanks for showing us the process for your terrific quilt. I love how ambitious you are with your ideas. I would personally echo quilt; I think it might make a really awesome effect. Awesome! I immediately recognized this as a Spirograph design before you even said so! We used to have that set when I was young. I remember the pens that came with it ran out of ink SO fast! !